These days it seems just about anything can be adapted into a film. Books and plays are the most common, but we've had movies based on comic books, video games, songs, old tv shows, even board games. One thing you don't see adapted into film that often, though, are paintings. The only example I can think of is GIRL WITH THE PEARL EARRING. 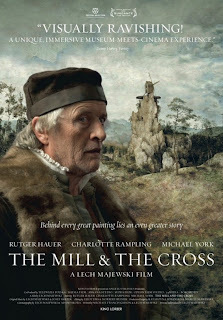 Well now there's another: writer/director Lech Majewski's THE MILL AND THE CROSS, which brings to life the 1564 painting The Way to Cavalry by Pieter Bruegel the Elder as interpreted in an essay by art critic Michael Francis Gibson. No jokes about watching paint dry, please. Bruegel's original painting is an incredibly detailed depiction of Jesus carrying the cross updated to what was, for the artist, contemporary times. The context has also been changed, with the Christ figure now a Flemish peasant being executed by the Spanish army, who ruled over the area at the time. So in addition to the religious aspect, there's also some political subtext going on here. Speaking as Bruegel, Rutger Hauer explains that his Christ figure is almost hidden amidst the literally hundreds of figures populating the painting, representing how the original crucifixion and Jesus himself were paid little attention to at the time. Nonetheless, this figure forms the center of everything else that surrounds it, the other aspects of the painting radiating out from it like a spider's web. Aside from Hauer, the only other speaking roles are essayed by Michael York as a nobleman who serves to comment on the politics of the time (and the painting), and Charlotte Rampling as the painting's Virgin Mary who serves to comment on the religious aspects. These three each have a handful of short monologues (and in the case of York and Hauer, a couple dialogues) scattered throughout the film. Otherwise, we simply watch as various characters and situations from the painting are turned into short vignettes. 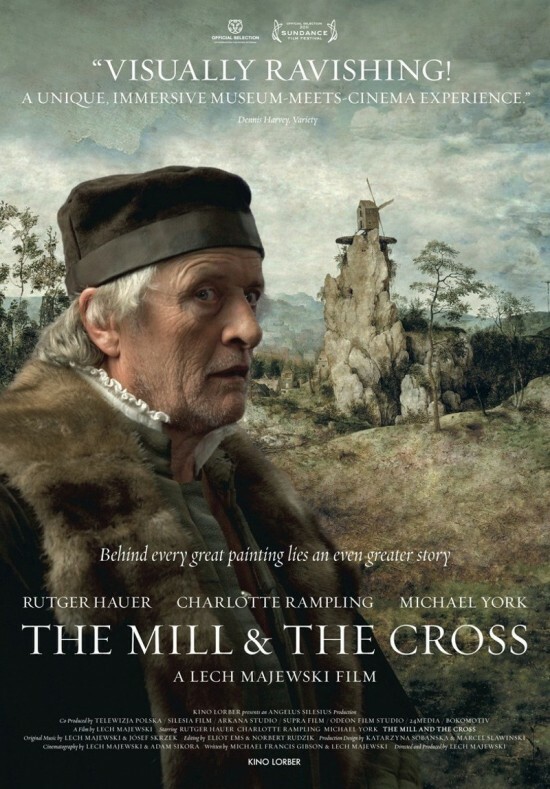 THE MILL AND THE CROSS may be slow paced, but it is absolutely beautiful to look at, and I would imagine anyone interested in understanding the process of conceiving, making and interpreting a work of art would find it informative and engrossing. It's also cold and distant, far more concerned with scholarly examination than any kind of emotional impact a work of art can have. If there's one thing missing from the film, it's that sense of feeling that comes from truly experiencing a painting as opposed to trying to root out all the meaning and technique that went into it. 3 out of 4 stars.